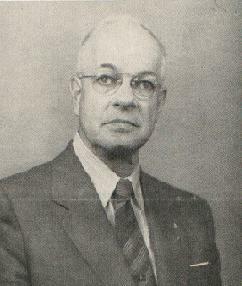 Fred E. Howe was elected Commander-in-Chief of the Sons of Union Veterans of the Civil War at the 75th National Encampment in Harrisburg, Pennsylvania, September 13, 1956. C-in-C Howe is a member of H C. Berry Camp #89, Niagara Falls, New York, a Past Commander of his Camp, has served his Department in different official offices, and was Department Commander in 1946-47. He served as Senior Vice Commander-in-Chief last year. He attended Niagara Falls High School and was a member of the firm of E.R. Howe & Son, Inc; wholesalers of confectionery school supplies, fruits and syrups until his retirement on December 31, 1952. He is a member of the Zion Evangelical Lutheran Church; Niagara River Lodge 785 F&AM; Niagara Lodge of Perfection AASR; Moore Square and Compass Club; Advisory Council of Power City Chapter Order of DeMolay; Oppenheim Zoological Society of Niagara County; Retired Men=s Club of Niagara Frontier; a voting member of the Niagara Falls Boys Club; and an adopted member of the Indian Defense League of America in the Beaver River Clan of Tuscarora Indian Tribe. His grandfather, Leander Howe, enlisted from Worcester, Massachusetts as a private in Company A, 51st Regiment Massachusetts Volunteer Infantry. His active service terminated July 27, 1863, after which he reenlisted in Company D, 4th Regiment Massachusetts Heavy Artillery and was mustered out on June 17, 1865 at Washington, DC.